A friend once said "pretty is always in style" and this lovely chandelier, dripping in delicate beading and small crystal balls certainly proves this point. 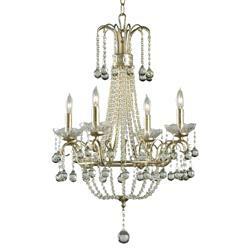 Perfect for French Country inspired spaces, the contrast between the distressed champagne leaf finish and the glistening crystals on this chandelier creates a beautiful antique effect. Four candelabra bulbs cast an elegant light upon whatever room you choose.